Easter goodies are so much fun! 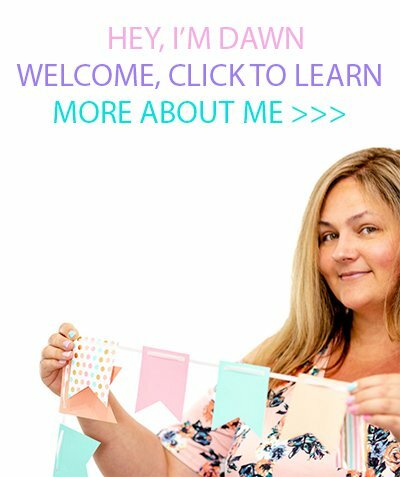 From delish desserts to colorful treats, I love to roll with it! 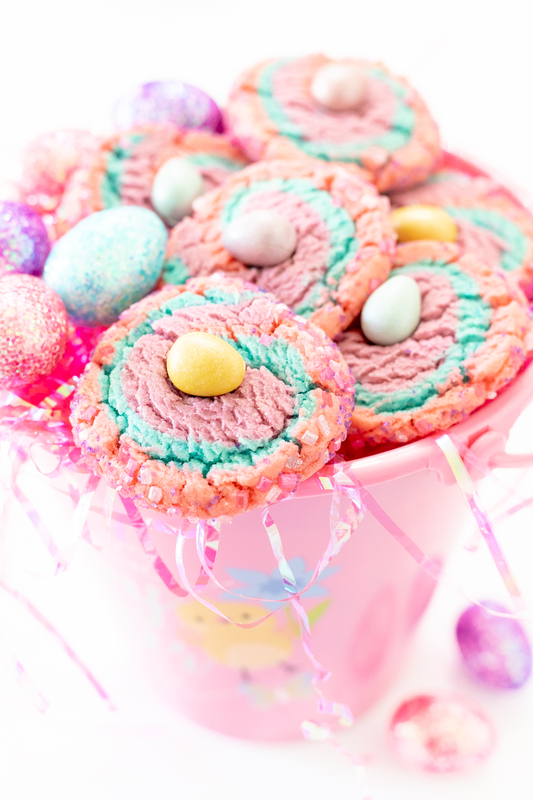 Today I’m actually sharing some of the Easter Bunny’s very favorite cookies. Yup! 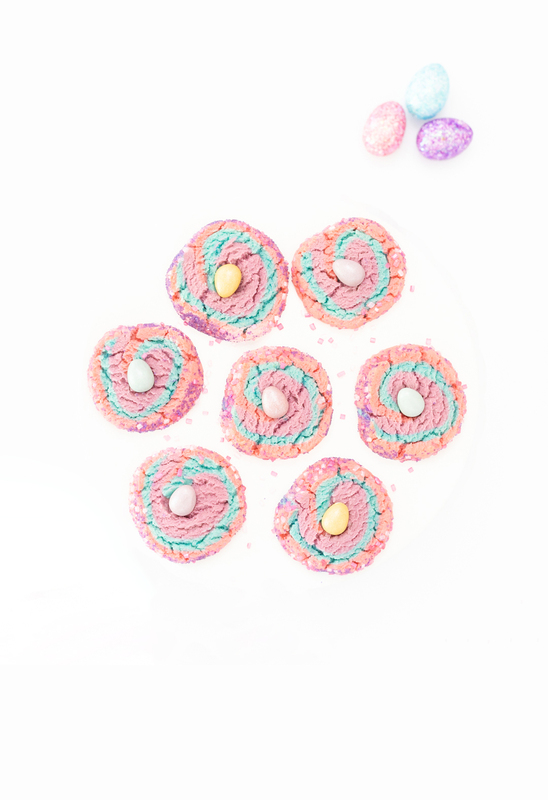 Enter these super easy and colorful Bunny Magic Swirl Cookies. If there’s one thing I know, it’s that every *bunny* totally loves CADBURY MINI EGGS. 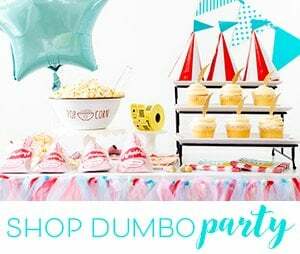 Speaking of bunny magic… since two is better than one, I’ve teamed up with one of my favoritest new blog friends Lisa at Fabulous Habits to bring you more ways to use these yummy chocolate bites of goodness this Easter. I’m stoked to introduce her adorable candy egg cupcakes! Make sure to go check them out and bookmark em’ too! 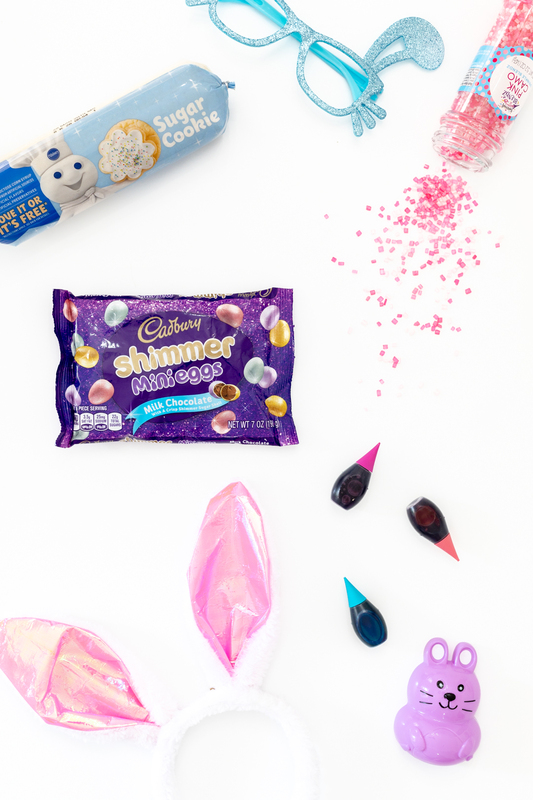 When I first learned about the new CADBURY Shimmer MINI EGGS, I knew I had to come up with an excuse or ten to use them. Today is the day, my friends. These pretty chocolates are going to be perfect for all of sweet Easter creations. Now, lets make these fun neon swirled cookies. Using pink, purple and blue neon gel food colors, these pretty cookies are sure to make you smile. Let’s make these the easy way! CAN YOU ADD FOOD COLORING TO PREMADE COOKIE DOUGH? Yes. You totally can. After a little bit of research, I discovered how simple it is to incorporate food coloring into store bought refrigerated cookie mix. Adding a little bit of flour helps balance it out since the liquid food coloring will make the dough more wet and sticky. 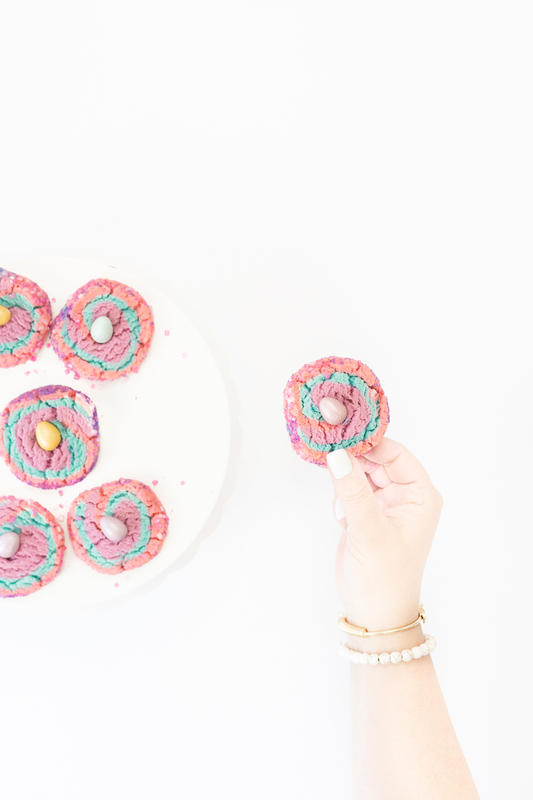 This rainbow swirl cookie recipe using this exact method was the total inspiration for today’s base recipe. STEP ONE: Preheat your oven to 350°F. STEP TWO: Divide the dough into 3 equal parts. STEP THREE: Add different gel food color to each (pink, purple and blue) and add a heaping tablespoon of the flour to each to keep from becoming sticky due to the addition of liquid. Add a little more if needed. STEP FOUR: On a floured surface, roll out each of the colored doughs to the about the same sized rectangles. (Approx 9×5) Trim the edges to make them sharp as needed. Stack the dough rectangles on top of each other. STEP FIVE: Slowly roll the dough up from the long edge in making sure to patch up the dough as it may crack a little as you do. Once rolled up, gently roll the dough around to form a good circular cookie shape. Make sure to press the dough back in from both sides to keep the length from expanding. STEP SIX: Spread some colored sparkling sugar on a clean work surface or parchment paper and roll the dough over it to coat it. STEP SEVEN: Place dough in freezer for about 5-10 minutes. Remove and cut the dough into 1/2″ slices and place on a non-stick baking sheet. STEP EIGHT: Bake for 7-10 minutes. FINAL STEP: Remove from oven and immediately press a candy egg into the center of each cookie and continue cooling. Preheat your oven to 350°F. Divide the dough into 3 equal parts. Add different gel food color to each (pink, purple and blue) and add a heaping tablespoon of the flour to each to keep from becoming sticky due to the addition of liquid. Add a little more if needed. 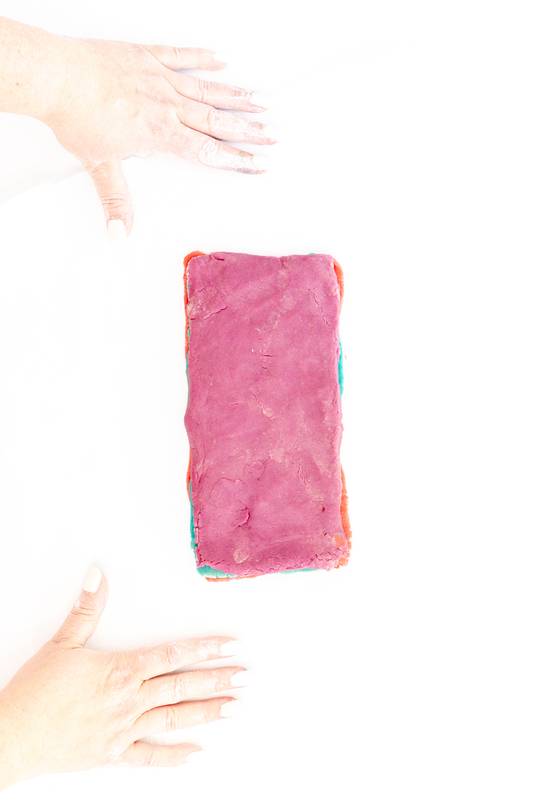 On a floured surface, roll out each of the colored doughs to the about the same sized rectangles. (Approx 9x5) Trim the edges to make them sharp as needed. Stack the dough rectangles on top of each other. Slowly roll the dough up from the long edge in making sure to patch up the dough as it may crack a little as you do. Once rolled up, gently roll the dough around to form a round cookie shape. Make sure to press the dough back in from both sides to keep the length from expanding. 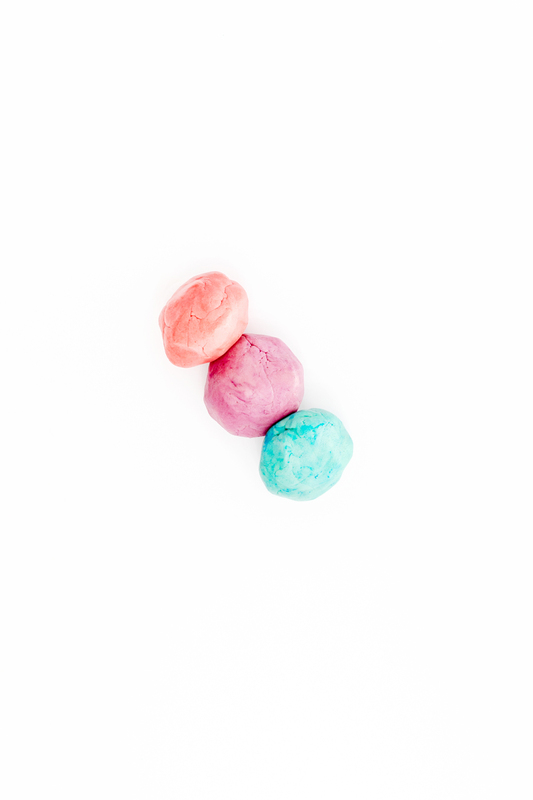 Spread some colored sparkling sugar on a clean work surface or parchment paper and roll the dough over it to coat it. Place dough in freezer for about 5-10 minutes. Remove and cut the dough into 1/2" slices and place on a non-stick baking sheet. Bake for 7-10 minutes. Remove from oven and immediately press a candy egg into the center of each cookie and continue cooling before serving. Makes about 14 cookies. You now have a batch of bunny magic cookies that are bright and colorful. They will lend a lot of fun this Easter! I hope you like them as much as I do! Drool-worthy, Pin-worthy, and totally worthy of me stuffing my faaaace! They're almost too cute to eat, but heck, I would never do that to my sweet tooth! These need to get in my belly NOW!